Ichingo Chobe River Lodge offers the ideal location to experience all that the Chobe has to offer with the added benefit of being on the Namibian side of the river. Quieter, more secluded and personalised the lodge is ideal for families, couples or groups.The lounge, bar and open air-dining room set above the flowing waters of the Chobe River provide the ultimate in comfort allowing you to completely unwind and enjoy the sights and sounds of a true African river safari experience. 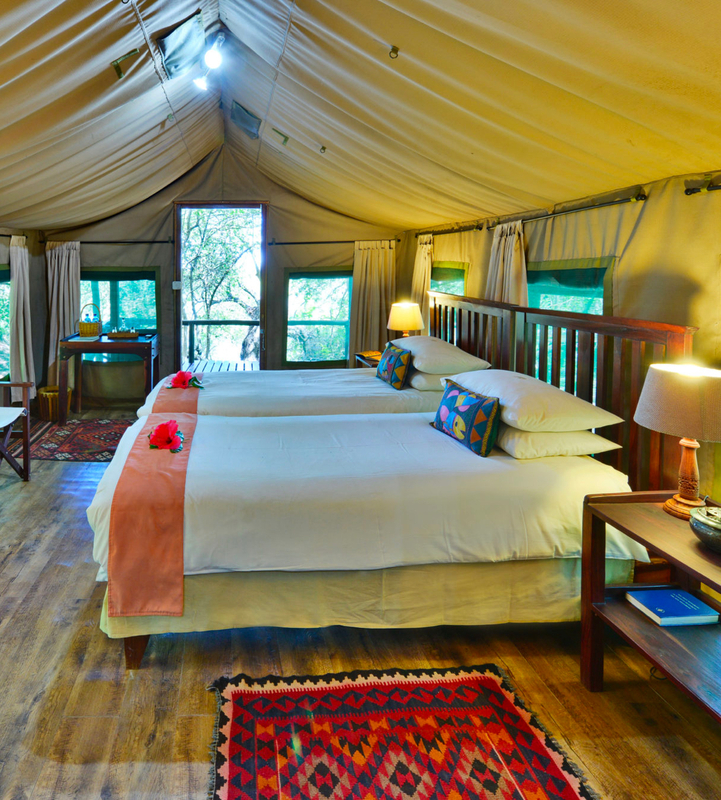 Our eight large air-conditioned Meru safari tents give you all the excitement of a safari adventure in Africa each with an en-suite bathroom and private balcony. There is also one family tent available which is a main tent with an adjacent smaller children’s tent to offer parents peace of mind. Our large Meru safari tents at Ichingo Chobe River Lodge give you all the excitement of a safari adventure in Africa, coupled with the ultimate in comfort. Your large air-conditioned safari tent comes complete with a king-size bed, a dressing table, bedside lamps, chairs and an en-suite bathroom – everything you’d expect from a deluxe hotel. At the same time, because you’re in a tent you won’t lose that feeling of being in the thick of the African bush, as you listen to the sounds of the Chobe River flowing past you and the call of fish eagles in the distance. Our safari tents are all air-conditioned, so you get welcome respite from the African heat which means you can truly relax and unwind. Our bathrooms have all been renovated with new floors, vanities, shower heads and taps so you don’t have to miss out on modern luxuries while you’re on safari. Nestled on Impalila Island in Namibia, Ichingo Chobe River Lodge is a tented lodge surrounded by breathtaking scenery, abundant wildlife, birdlife and ideal fishing conditions. Ichingo Chobe River Lodge features eight large air-conditioned Meru safari tents set on a secluded island beneath a riverine canopy on the banks of the Chobe River. Step out on to your own private balcony to listen to the rapids, relax on your sumptuous bed and then head to the dining room or bar for something delicious to eat or drink. Ichingo Chobe River Lodge is also perfect for families and welcomes children of all ages. Ichingo Chobe River Lodge offers a 2 or 3 night itinerary which includes a variety of activities for you to experience during your stay. These include game viewing by boat along the banks of the Chobe National Park, an excursion through the beautiful Kasai Channel to see the mighty Zambezi River and a guided walk on Impalila Island to visit our famous ancient Baobab tree. Fishing for the legendary Tigerfish is also an activity option. Because of its unique geographic location, the game viewing and birdwatching in and around Ichingo Chobe River Lodge is second to none. Plus, you can get up close and personal with the wildlife as you glide towards them silently on the tender boats. The lodge’s location is particularly well known for its high quality fishing in over 100kms of the Chobe and Zambezi Rivers, where you can hook a tiger fish, bream and several other fresh water species. A choice of activities at Ichingo Chobe River Lodge are included in the rate, as well as a vehicle-based game drive in the Chobe National Park on the day of departure. The activities on offer can be viewed here which guests can select upon check-in. Our rates vary throughout the 2019 season, so please take this into consideration when planning your stay. All rates are in South African Rands (ZAR) and include 15% VAT. *When arriving at the Kasane and Namibian Immigration Offices guests need to fill in the required immigration forms to gain access and departure permission from the relevant authorities. This process can take between 45 to 60 minutes to complete and needs to be considered in terms of timing and pre-planning when coming to stay at Ichingo Chobe River Lodge. • Community development levy. The Community Development Levy will reflect as a separate line item on all invoices issued. The funds collected will supplement our community projects and initiatives run by the Zambezi Queen Collection to assist with education, health care and basic community services. Rates for 2019 is ZAR 65 per person per night. • Only written cancellations will be accepted. An acknowledgement of the cancellation will be sent from the reservations department. Alternatively call our expert consultants or send us an email to enquire with us.